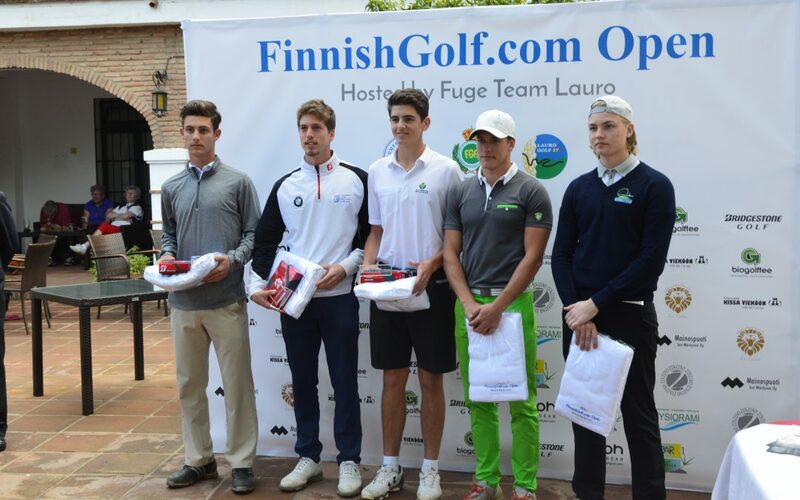 Our players Elias Azzam and Andrea Gobbato won the second and third position at the Finnish Open 2017, which took place last week the 23th, 24th and 25th of February, in Lauro Golf. A total of 59 players participated in the Championship that was played in stroke play mode, 54 holes. From our UGPM Team, our players Andrea Gobbato, Elias Azzam, Cristian Asensio, Ryan Henn and Juan Muñoz participated in the Finnish Open. Elias and Andrea ended both with a total result of +8. Elias showed a steady improvement in his game development making +5 the first day, +2 the second and finally +1 the third. It is noteworthy to stress that our player Juan Muñoz was also among the top 10, ranking the seventh. Unfortunately, the rest of UGPM players did not manage to position themselves in the top 15. The Finnish Open 2017 was characterized by three intense days of competition. Elias was leading the second day and fought for the first place until the end, but finally the player Pablo Alonso, from the Andalusian Golf Federation, won the championship with a total of +7. As always after a competition, in UGPM we will review this week the overall performance of our players who have participated in the Finnish Open to evaluate their play development. Congratulations Elias and Andrea for the second and third place!